Sherry FitzGerald O’Meara bring this beautifully presented home sitting on an elevated site of half an acre in the sought-after area of Glasson, Athlone. This spacious home offers in excess of 2,000 square feet and a floor plan designed for modern family living. The interior of the home offers five bedrooms, three reception rooms, four bathrooms, central heating, insulated attic and pumped walls, water softener treatment unit, an alarm, and attractive decor. The exterior of the home offers detached, landscaped gardens and space for private parking. The property is situated less than a five-minute drive from award-winning restaurants, all local amenities and the Dublin-Galway motorway. The home is approximately 190 square metres with a BER C2 energy rating. 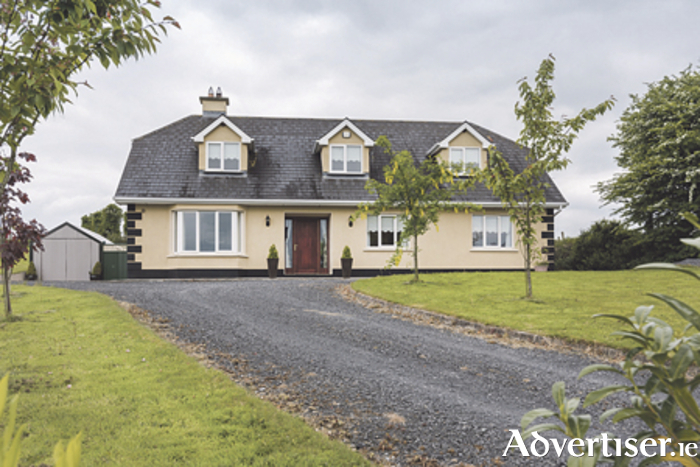 This is the ideal family home and must be viewed to be fully appreciated.